The Toronto Blue Jays have won promotion for the second straight season, finishing with more wins than any other Second Division team in 2014. The Blue Jays will join the San Francisco Giants in promotion to the First Division in 2015, while the Boston Red Sox and Arizona Diamondbacks are going down. The Toronto Blue Jays, who were stuck in the Third Division for four years, suddenly are headed to the First Division after two consecutive years of promotion. The Blue Jays will join the San Francisco Giants on their way to the top tier. The Giants won the Second Division in 2014, and they did it without a single postseason game on their way to the World Championship counting in their Second Division totals. The Giants were solid throughout the year in Second Division games, finishing 22-9. The Blue Jays played a lot and won a lot, going 32-22 for second place. The New York Yankees made a strong bid for promotion back to the top tier, but finished 31-24, 1 1/2 games down to the Jays. The season went down disastrously for the Arizona Diamondbacks and the Boston Red Sox, both of which are going down to the Third Division for 2015. Since their promotion to the Second Division after the 2011 season, the Diamondbacks made little impact at that level. 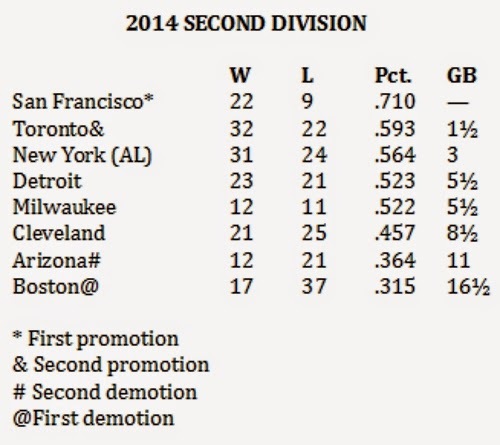 The Red Sox, demoted to the Second Division after the 2012 season, now have a long road back to the top.